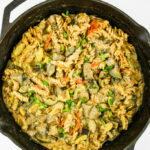 This One Pot Ratatouille Pasta recipe is an unbelievably simple gluten free and vegan dinner dish. The rich flavors of ratatouille all come together in one pot and it’s done in under 40 minutes! Who amongst you loves a good one pot dinner? 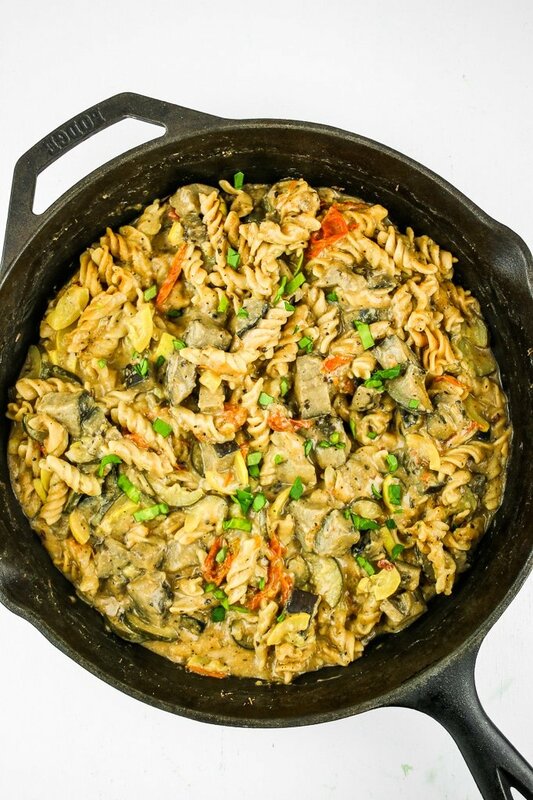 How about a good one pot pasta? I see lots of hands going up.  Because seriously, how could you NOT love a meal that comes together ALL in one pot and takes less than 40 minutes? Yeah, I thought so. I could not possibly decide what I love most about this dish. Is it the easy process? Is it the rich depth of flavor? Is it the medley of vegetables? Is it the protein packed pasta? Wait, what? Hold up. Rewind. 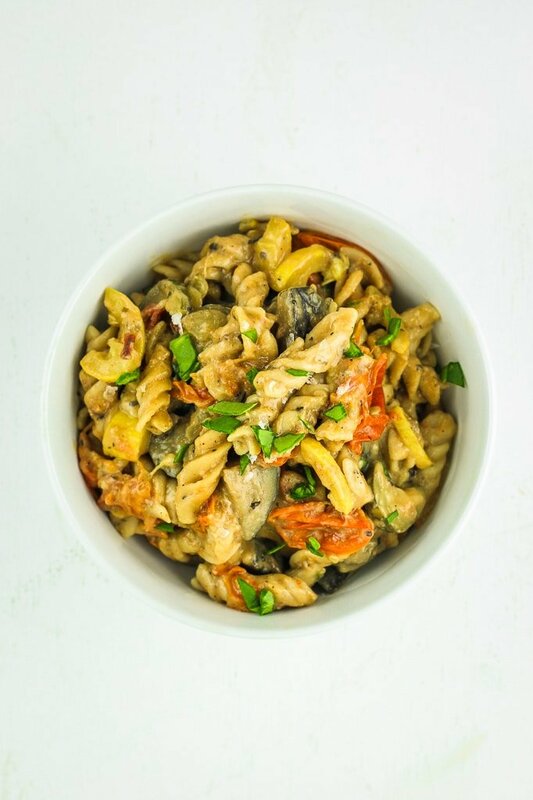 Did I just say “protein packed” pasta? Why yes, yes I did. 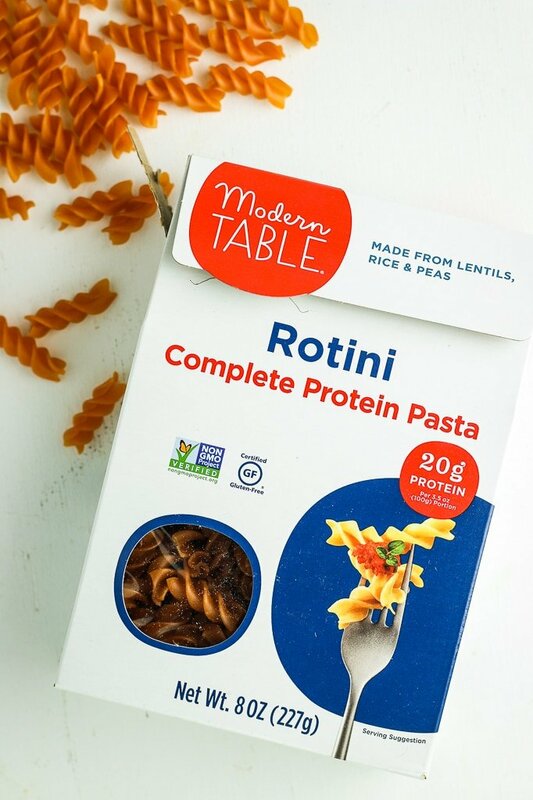 I am referring to the miracle that is Modern Table Red Lentil Rotini – with only three plant-based ingredients, the plain pastas are vegan, non-GMO, and gluten-free.  We have officially entered new territory in the pasta game and I am so here for it. I have tried SO many other gluten-free pasta options and Modern Table is hands down my #1 pick. The texture of their pasta is perfect, it cooks quickly, and it actually tastes like pasta. All pastas are lentil-based and contain complete proteins – meaning they have the 9 essential amino acids our bodies need for strong energy, good digestion, and muscle health.  So you’re still eating pasta, but now you’re eating pasta with benefits! Ready? Let’s do this. Start off by prepping your vegetables and the other ingredients (seasonings, liquids, etc). I specify the best way to chop each veggie in the recipe card below. Portion out all of the other ingredients and set them nearby so you’re ready to go when the recipe calls for each one. Sauté all of your veggies over medium heat for a few minutes, then carefully smash the tomatoes and add the garlic. Sauté for a couple more minutes until the garlic is fragrant. Don’t overcook or “brown” the garlic – it will turn bitter! Next up, add coconut milk and water and bring the whole pot to a boil. Once the pot is boiling, add in your Modern Table pasta and the seasonings, then give everything a good stir to fully combine and coat everything. Cook for 12-15 minutes until the pasta is al dente to your liking, then serve and enjoy! Just 5 steps. 5 steps! 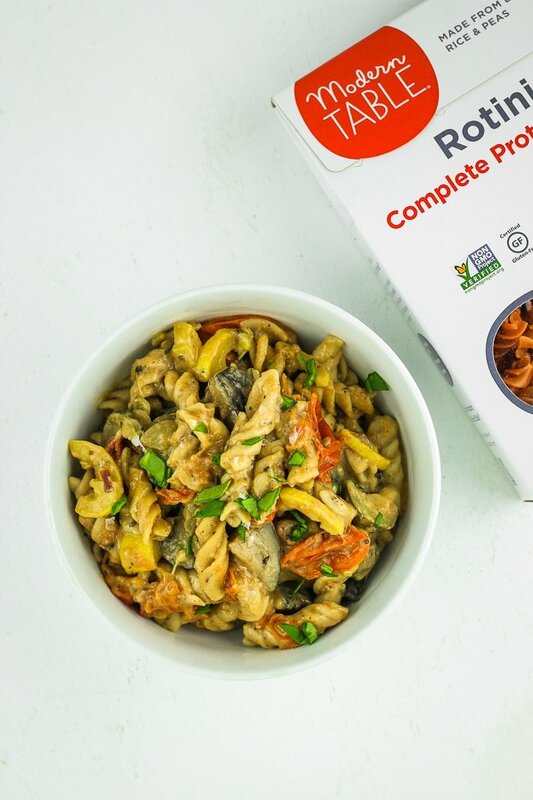 That’s all it takes to create this deeply flavorful, protein packed, and veggie loaded one pot pasta dinner. We are winning the dinner game right now, you guys! 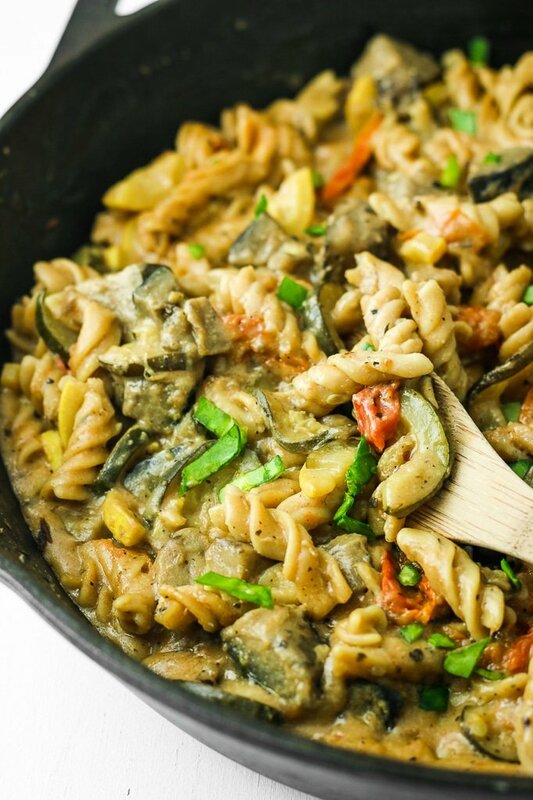 Sooooo… you’re gonna make this One Pot Ratatouille Pasta tonight right? It’s just too unbelievable that a dinner this good can come together so easily and so quickly. But, it can! I promise. 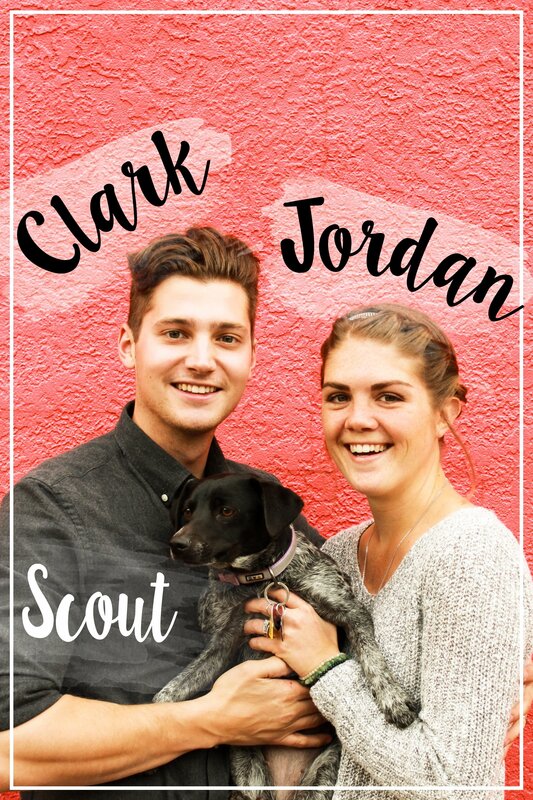 Test it out and let me know what you think – leave a comment below and snap a picture for Instagram so we can share on our stories! Prepare veggies as instructed above. 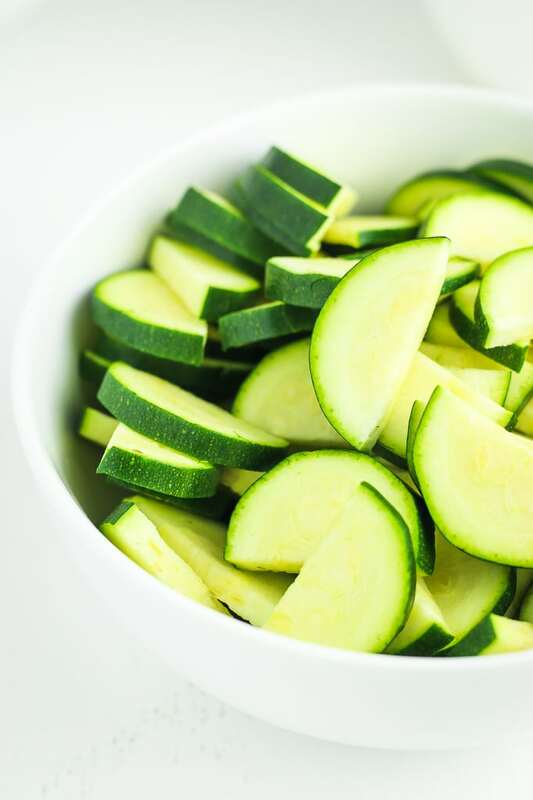 For zucchini and yellow squash, chop off the ends and slice in half lengthwise. From there, slice into “half moons” about 1/4 thick. For eggplant, chop into cubes about 1/2″ square. In a large nonstick or cast iron skillet, heat 2 tablespoons of olive oil to medium. Add eggplant and cherry tomatoes and cook for 10 minutes, stirring occasionally. After 10 minutes, the eggplant and tomatoes should be softening. Add zucchini and squash – and another tablespoon of olive oil if necessary – then sprinkle with 1/4 teaspoon each of salt and pepper. Sauté for 5 minutes. At this point, use the back of your spoon or spatula to gently smash the tomatoes. Add in the garlic and sauté for 3 more minutes. Add coconut milk and water and bring to a boil. Once boiling, add pasta, herb seasoning, red pepper flakes, nutritional yeast, and 1/4 teaspoon each salt and pepper. Stir to combine. Cook 12-15 minutes until pasta is al dente and the sauce has thickened.